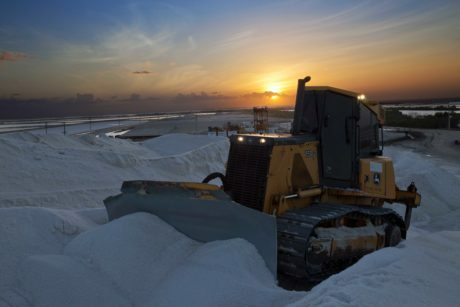 Deere equipment proves to be the perfect solution for Brazilian sea salt extraction. 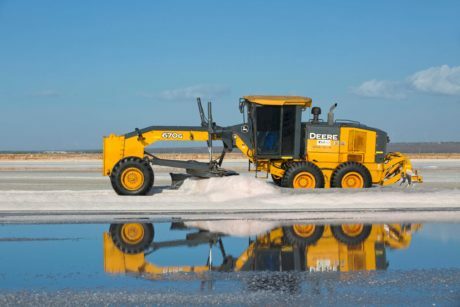 Both John Deere Construction and Ag equipment are being used in the salt extraction process. Along the tropical coast of northern Brazil, near the city of Mossoro, motorists pass a strange sight: rows of white mountains that look like snow. These large mounds are actually salt harvested from the ocean by Salinor – Salinas do Nordeste, a 30-year old company that produces 45% of Brazil’s sea salt. It was while traveling to and from work and looking at these salt piles that Vitor Dubiela, a Salinor engineer, got an idea. He’d worked with Veneza Equipment, a local Deere distributor, on another project, and he began to wonder what role John Deere and its machines might play in helping the company harvest salt. Dubiela contacted Veneza Equipment. With the distributor’s help, several studies were conducted to test the effects of sea salt on Deere construction equipment. “The extraction process takes place in an aggressive atmosphere due to the corrosion that the salt causes,” Dubiela explained. “We had to analyze the effect of the salt on the equipment, and this way we could take action and make improvements to the machines,” said Ajomar Medeiros, a representative of Veneza Equipment. See how John Deere equipment and technology provided Salinor with efficient solutions to move forward. 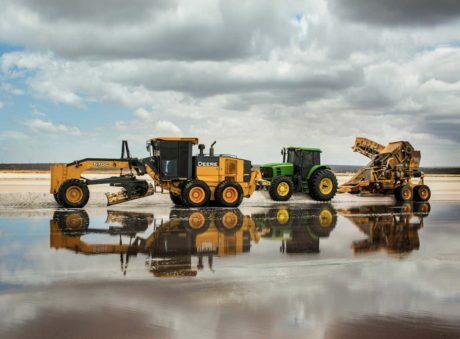 These studies led to solutions, such as protective treatments on cooling package components, and helped pave the way for Salinor to begin using Deere construction machinery. After almost six months of negotiation – and development of specific product solutions – Salinor became a Deere customer in 2016. The negotiation resulted in the delivery of a big package of Deere products: two Backhoe 310K Loaders, eight 724K Loaders, four 670G Moto Graders, four 210G Excavators, four 750J Crawler Dozers, In addition, Salinor purchased six 6145J and four 5078E Tractors. 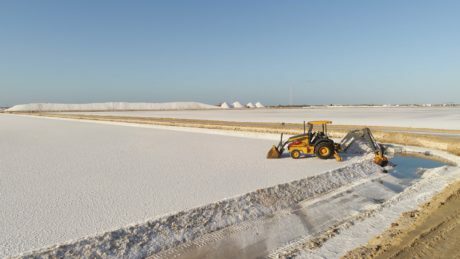 About one year later, Salinor had reduced its number of salt extraction machines from 80 to 40, as the Deere equipment proved to be more efficient. The precise transmission system of Deere’s 670G Motor Grader, which provides smooth gear and steering changes, helped deliver better control and leveling accuracy, Dubiela said. “The equipment is ideal for harvesting the evaporated salt from the water,” he explained. And that wasn’t all. Deere’s 750J Crawlers organize the salt piles to make it easier for the 724K Loaders to load it on the trucks and wagons. 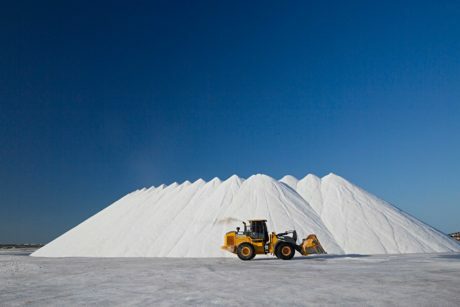 “John Deere arrived at the moment we needed to increase the size of our equipment, so that we could harvest the salt quicker,” said Airton Torres, the administrator of Salinor. The company also took advantage of Deere technology with the remote monitoring provided by JDLink™ and ADVISOR ™. “The only company that met our aspirations was John Deere,” Dubiela added. If you enjoyed this article, you might also enjoy some of the other technology-related stories below.